"The Old Vicarage and its gardens, belong to the residents who have chosen to make it their home. We are here, as a team, to watch over the Home, to make sure that we provide holistic care* in a friendly, family atmosphere. Our residents are treated like our extended family, and looked after in a way we would wish for one of our own family members." *holistic care is care that looks at ‘the whole’ person, their likes and dislikes, personality and beliefs. Mike's previous career involved working in adult social care and at the time he wondered why care homes he visited were of such a poor standard. Run down buildings, unclean and smelling, restrictive care practices and institutionalised ideas. 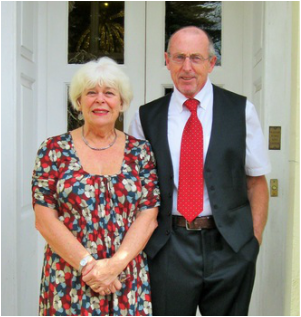 Pat and Mike came from a family background in hotels and Bed and Breakfast and felt that there was no reason those 'hotel' standards could not be transferred into a care home environment. When the building was converted Pat and Mike made sure the interior was well designed, decorated, warm, friendly and that every bedroom had an en-suite toilet and washbasin, with the larger rooms also having a bath. Today this is what you would expect, but in the 1980's it was normal to have shared facilities. This was unheard of for a care home in those days and it set The Old Vicarage apart from other care homes, and so the reputation of The Old Vicarage started to grow. From the start Pat and Mike also focused on creating a family feel to the home and their young family were integral to the home, each one of their three children going on to work at the home in the coming years. Pat in particular has an eye for detail and sets the standards of the home, paying attention to the little details that help to make us special. This includes delicious home made food and cakes, our special events, quality furnishings and linens that make all the difference. For this reason many of the people who came to live here in the early days were retired people who were still very active and able, they often kept driving and maintained very independent lives by going out and playing golf, and attending community events. People chose to live at The Old Vicarage because it suited their lifestyle, being waited on, looked after by, and socialising with the large, friendly, family that is 'The Old Vicarage'. Throughout the years little has changed with regards to our standards, our atmosphere and our reputation. While we do still get people who choose to come to us earlier on in their lives, it is much more common for people to come to us once they feel they are more in need of help and are not coping so well at home. But we have moved with the times and have always met the increasing care needs of our residents, without compromising on all those special ingredients that make The Old Vicarage stand out. Even today we are continuously looking for ways to make things better and improving wherever we feel we can. We do this by listening to our residents and their families and friends. Pat and Mike are still actively involved in the running of the home and maintaining the beautiful gardens. In 2013 their youngest daughter, Rebecca, rejoined the team after a career with the London Ambulance Service as a Paramedic. Rebecca was joined by her partner Dan who has a background in engineering and premises management. At 11 years old Rebecca, along with her brother and sister, was actively involved with the original conversion of the home, painting, gardening and DIY before her first job in the kitchen and then later as a Care Assistant. The Old Vicarage really is in her blood and she is passionate about it, she wants the best for the residents, the staff and the future of the home. All of the family live nearby and are on hand for any emergencies or support required. As villagers we are part of our local community and ensure that the home and our residents are part of that community as well. We have always seen our residents and their relatives as an extension of our own family and therefore we are loyal, caring and committed to continuing to provide the best service we can to the people we care for. "The family are amazing, they never pull a face about anything they are so patient they always listen, remarkable people."